The declaration is bold, but the scholarly support and anecdotal evidence is compelling. Studies have shown that the highly social and collaborative nature of the popular fantasy role-playing game cultivates a range of social-emotional skills, which can lay the foundation for improved learning. In addition to these crucial soft skills, teachers and professors who have used the game also claim it directly benefits core academic competencies. David Simkins, a professor at the Rochester Institute of Technology, is an expert on games and learning. His research indicates that role-playing games (RPGs) can boost learning and stimulate intellectual curiosity and growth. Countless video games inspired by Dungeons & Dragons are rendered with immersive, graphic rich environments, but the tabletop original demands that players conjure the three-dimensional world in their mind’s eye. Books, maps and many-sided dice govern the rules of these kingdoms of the imagination, and the players are guided by a Dungeon Master, or DM, who is the narrative architect and referee of the emerging campaigns. The open-ended game can last for months, or even years. It’s not difficult to see how collaborative world-building involving storytelling, decision making, invention, research, calculations, negotiation, role-play, and active spatial visualization can stimulate a developing intellect. And, despite the burnish of fantasy, invented realms are derivative, and thus applicable, to the real world. “Geography from maps, recursive math from die rolling and adding/subtracting modifiers, philosophy, logic from the ever-present need for decision making, science in regards to the ecology of an environment, the weather, the climate of different terrains, as well as many scientific details learned from monsters, which were almost all taken from mythology or reality in one way or another,” said Wells, cataloging what his kids learn from the game. Dungeons & Dragons is an innately multidisciplinary and multimodal experience, which is why scholars and educators like Wells tend to describe its learning benefits in terms of lists and inventories. Its implementation as an instructional tool, then, is not only fun, but also becomes a sort of curricular node with the capacity to engage students in a wide array of skills and subjects. In one striking example, educational researcher and teacher Alexandra Carter used a student-modified version of Dungeons & Dragons as the centerpiece of a yearlong program with a Grade 3 class that combined math, reading, writing, and social studies. Many students in the class struggled with academic and behavioral challenges, but rooting their core subjects in the game produced remarkable results. Carter observes that a great deal of the project’s success hinged on students being motivated to learn and practice skills that applied to the game. Students often have trouble appreciating the value of what they learn in school when it is abstracted from its real-world purpose. In this case, learning was meaningful for the students because it had traction in a fantasy world that stood in as a facsimile for the real one, the central dynamic of play and a key feature of its value for development and learning. Although Dungeons & Dragons seems better suited to teach humanities, every shield block and fireball relies on a little bit of science and lots of math. Incorporating games of any sort into the curriculum generally requires that teachers create context to direct play towards the learning objectives. 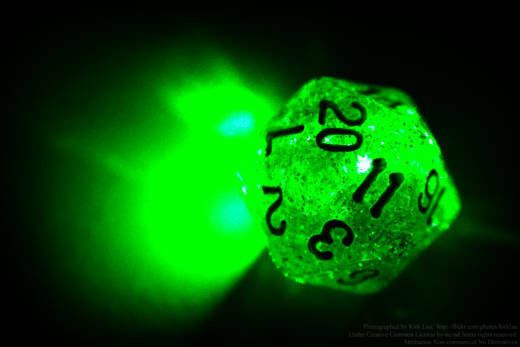 RPGs like Dungeons & Dragons are pliable systems that lend themselves to be creatively modified, which makes them ideal to serve diverse curricular purposes. UK educator Chris Leach, for example, reworked the game and leveraged the fantasy motif to instruct Grade 6 students on the basics of algorithms and binary, the foundation of computational thinking. “If you are at all 'science enabled' as a DM there are ample opportunities to discuss scientific topics, even if magic bends reality in ways that science would not allow," said Slater. "Even examples of scientifically impossible magic can be used as tools to discuss what science actually does say about a subject." With a little ingenuity, chemistry can be applied to the existing alchemy scheme; physics operates in every projectile, fall, and collision; biology lurks in the countless flora and fauna that populate the world, and the game’s engineer class is an open invitation to justify contraptions with hard science. And math is the low hanging fruit. “Math is constant, and completely necessary to play the game,” said Wells. D&D is fundamentally a numbers game, and players must consult charts and tables to modify their rolls of dice, and calculate everything from currency exchanges to their projected experience points. Those who want to be masters of their destiny can leverage math, especially probability and calculus, to bend the numbers in their favor. There are numerous websites, forums and online calculators to assist players with mathematical assistance to further their progress. With no coaxing from parents and teachers, players are motivated to research and access these resources to optimize their play, an inevitable boon to their numeracy skills. Carter observed many of her previously demoralized students become invested in math due to the game. These intriguing case studies point to what a comprehensive learning program might look like if subjects and skills were not taught in isolation from each other, but integrated into a single cohesive system where students are intrinsically motivated to participate. It combines project-based learning, game-based learning, social-emotional learning and any number of other hyphenated initiatives that aim to invigorate an education system that is too-often out of step with the world it hopes to service. A chaotic good character does what is necessary to bring about change for the better, disdains bureaucratic organizations that get in the way of social improvement, and places a high value on personal freedom, not only for oneself, but for others as well. Dungeons & Dragons is a salient example of an imaginative and timely intervention, but sword-and-sorcery is not for everybody. The plasticity of RPG systems allows for the implementation of any theme or setting, and students can be enlisted to help design the games around a specific topic. Also, teachers like Kade Wells are not only using RPGs in their classes, but turning their classes into role-playing games which further restructures the operations of a traditional education system. Ultimately, whether using games, RPGs, or any other initiatives, teachers have an unprecedented opportunity to exercise and model creativity, passion, problem-solving, and courage to re-author their personal and institutional narratives. With these mildly subversive but benevolent grassroots interventions they can rewrite the story of student, teacher and school into a legendary epic for the ages, and perhaps save the world along the way.